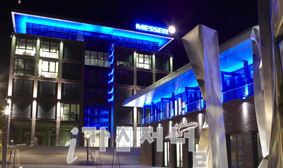 For the second time, Messer shuts off its lights at all locations in Germany. On March 30, between 8.30 pm and 9.30 pm, millions of people will once again participate in the worldwide initiative of the WWF. "We are committed to protecting our environment and the climate. To do this, we not only improve our own processes: we develop gas applications that make our customers' production processes more resource-efficient," explains Stefan Messer, owner and CEO of Messer Group. Since 2013, Messer has voluntarily published a sustainability report every year, in which the company presents its global activities for the protection of the environment and the climate in a comprehensible manner.